Welcome to the Joshua Tree National Park Information Page. Joshua Tree National Park is about 140 miles east of Los Angeles, near the resort and retirement region around Palm Springs. It is situated at the eastern end of Southern California’s Transverse mountain ranges. The eastern side of the park is bounded by the low lying Colorado Desert and the western side of the park is Mojave desert country. The nearest international airport is Los Angeles, CA at 140 west of the park and there is an airport in Palm Springs, CA just west of the park. 1. Take I-15 South to I-215 South to I-10 East to Stateroad 62 East to the north entrances of the park. 2. Take I-15 South to Stateroad 247 South to Stateroad 62 East to the north entrances of the park. 1. Take I-40 West to Highway 95 South to Stateroad 62 West to the park. 2. Take I-10 West to the park. 1. Take I-10 West to the south entrance of the park. Take I-10 East to the parks southern entrance or take Stateroad 62 North to the north entrances of the park. Joshua Tree National Park lies 140 miles east of Los Angeles, CA. You can get to the park from the west via I-10 and Highway 62 (29 Palms Highway). The north entrances to the park are located at the towns of Joshua Tree, CA and Twentynine Palms, CA. The south entrance at Cottonwood Springs, which lies 25 miles / 40 kilometers east of Indio, CA can be approached from the east or west, also via I-10. 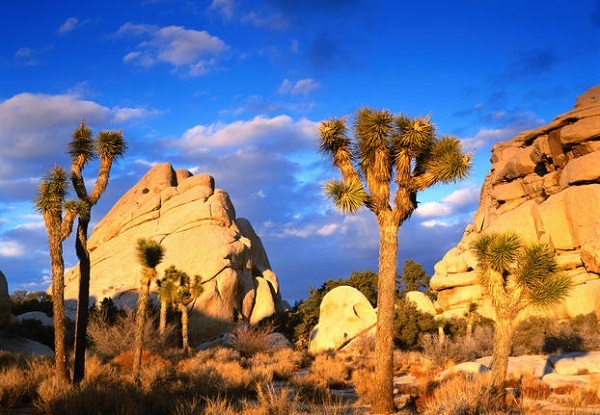 Joshua Tree National Park was proclaimed a National Monument 10 August 1936 by President Franklin D. Roosevelt and redesignated a National Park 31 October 1994. It was sesignated a Biosphere Reserve 1984. Mrs. Minerva Hamilton Hoyt, a wealthy California society matron, enjoyed visiting the area that today comprises Joshua Tree National Park. Expanded automobile traffic found its way to the area. Weekend Californians came to the desert to enjoy the clean, clear air, but also to confiscate various species of catcus for their home landscaping. When Mrs. Hoyt saw the devestation left by these weekend visitors, she persuaded President Franklin D. Roosevelt to protect this area by proclaiming it a national monument. The origianl Public Law passed by Congress set aside 825,000 acres as Joshua Tree National Monument. In 1950, the monument was reduced to 560,000 acres. The 1994 Desert Protection Act restored 234,000 acres and upgraded the monument to a national park. Joshua Tree National Park is opened year round. The peak visitation month is April. Each season adds its personality to the desert’s character. Two deserts come together at Joshua Tree National Park. The Colorado Desert, occupying the eastern half of the park, is dominated by the abundant creosote bush. The higher, slightly cooler and wetter Mojave Desert is the special habitat of the Joshua tree, extensive stands of which occur throughout the western half of the park. The desert is immense and infinitely variable, yet delicate and fragile. It is a land shaped by sudden torrents of rain and climatic extremes. Rainfall is sparse and unpredictable. Streambeds are usually dry and water holes are few. This land may appear lifeless, but within its parched environment are intricate living systems, each fragment performing a slightly different function and each fragment depending upon the whole system for survival. Two deserts, two large ecosystems whose characteristics are determined primarily by elevation, come together at Joshua Tree National Park. Few areas more vividly illustrate the contrast between high and low desert. Below 3,000 feet, the Colorado Desert, occupying the eastern half of the park, is dominated by the abundant creosote bush. Adding interest to this arid land are small strands of spidery ocotillo and jumping cholla cactus. The higher, moister, and slightly cooler Mojave Desert is the special habitat of the undisciplined-looking Joshua tree, extensive strands of which occur throughout the western half of the park. Standing like islands in a desolate sea, the oases provide dramatic contrast to their arid surroundings. Five fan palm oases dot the park, indicating those few areas where water occurs naturally at or near the surface to meet the life requirements of these stately trees. Oases once serving earlier desert visitors now abound in wildlife. The Joshua tree, Yucca brevifolia, is a giant member of the lily family. Like the California fan palm, Washingtonia filfera, the Joshua tree is a monocot, in the subgroup of flowering plants which also includes grasses and orchids. The Joshua tree provides a good indicator that you are in the Mojave Desert, but you may also find it growing next to a saguaro cactus in the Sonoran Desert in western Arizona or mixed with pines in the San Bernardino Mountains. Years ago, the Joshua tree was recognized by Native Americans for its useful properties; tough leaves were worked into baskets and sandals, and raw or roasted flower buds and seeds made a healthy addition to the diet.The local Cahuilla tribe has long referred to the tree as “hunuvat chiy’a” or “humwichawa;” both names now rest with a few elders still fluent in the language. As old as the desert may look, it is but a temporary phenomenon in the incomprehensible time- scale of geology. During the pleistocene, one of the Southwest’s earliest cultures, the Pinto people, lived here, hunting and gathering along a slow-moving river that ran through the now dry Pinto Basin. Later, other American Indian groups traveled through this area in tune with harvests of pinyon nuts, mesquite beans, acorns, and cactus fruit, leaving behind rock painting and pottery ollas as reminders of their passing. In the late 1800’s explorers, cattlemen, and miners came to the desert. They built dams to create water tanks and dug up and tunneled the earth in search of gold. They are gone now, and left behind their remnants; the Lost Horse Ranch and Desert Queen mines and the Desert Queen Ranch. In the 1930’s homesteaders came seeking free land and the chance to start new lives. Today many people come to the park’s nearly 800,000 acres of open space seeking the clear sky’s and clean air, the peace and tranquility, the quietude and beauty that only deserts offer. The nature trails at Cap Rock and the Oasis of Mara are accessible. An assistive listening system is available for use during ranger programs with prior notice. Plan your trip and the areas you would like to see and then go and relax and make a day of it. Go and see all that is in the area and enjoy it. You spend more quality time and learn and see more than you could ever imagine. Bicycling is permitted on public roads, both paved and dirt. There are no bicycle paths along roads. Bikes are prohibited on backcountry and nature trails. There are nine campgrounds in the park. There are all open year round. Six of the nine are available on a first-come first-serve basis. All of the campgrounds have tables and fire grates. There are picnic sites near the campgrounds. Food and supplies are available in Twentynine Palms, Joshua Tree, and Yucca Valley. Joshua Tree National Park is one of America’s best climbing sites, especially in the winter. The park’s natural walls feature the sharp edges, cracks and high friction that experienced climbers favor. There are also routes of varying difficulty. Thirty-five miles of the California Riding and Hiking Trail pass through the park. Two to three days are required to hike the entire length of the trail but shorter hikes of 4, 6.7, or 11 miles (6.4, 10.7, or 17.6 km) are possible. Additional information on hikes in the park is available at park visitor centers. While pets are allowed in the park, their activities are quite restricted. They must be on a leash at all times, they must never be left unattended — not even in a vehicle, and they are prohibited on trails. Backcountry camping and stock camping permits are required. Days are typically clear with less than 25% humidity. Spring and Fall – Temperatures are most comfortable in the spring and fall, with an average of 85 F and low of 50 F.
Summer – Summers are hot, over–sometimes well over–100 F during the day and not cooling much below 75 F until the early hours of the morning. Winter – Winter brings cooler days, around 60 F, and 32 F nights. In occasionally snows at higher elevations.